For most professionals on one of the four starting days of the main event, the first table is a chance to play against less experienced opponents and build up a stack for day two. However, there are always a few tables out there that can deviate from the norm. Here on day 1A of the 2011 main event, purple 362 in the Amazon room has been anything but easy for those who ponied up $10,000 to compete in one of the softest big buy-in fields of the tournament year. 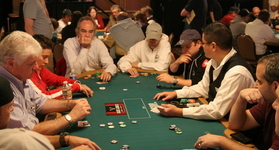 This table features elite pros such as Matthew Glantz, Vanessa Selbst, and Barry Shulman, in addition to a former online grinder and former Seinfeld star Jason Alexander, who is no joke on the felt. The group of players will continue to battle it out until the table breaks. Stay tuned to Card Player for more coverage of the 2011 World Series of Poker main event.